Of all the people to come to the rescue of the Constitution, who would have thought it would be Sen. Diane Feinstein (D-CA). Feinstein, after all, as head of the Senate Intelligence Committee since 2009, has yet to see an NSA violation of the Constitution, an invasive spying program or a creative "re-interpretation" of the law that she hasn't applauded as being lawful and "needed" to "keep people safe." Feinstein, too, was one of the first to fly into paroxysms of outrage at National Security Agency whistleblower Edward Snowden, absurdly condemning him for being a "traitor," though she surely knows that the Constitution very narrowly defines treason as "levying war" against the US, or providing "aid and comfort to the enemy." As Snowden surely did not "levy war" against anyone but perhaps the NSA, and even according to the government did not provide any information to America's "enemies" (whoever that may be in today's unipolar world, while he may have "stolen" NSA information, he didn't by any stretch, commit "treason." 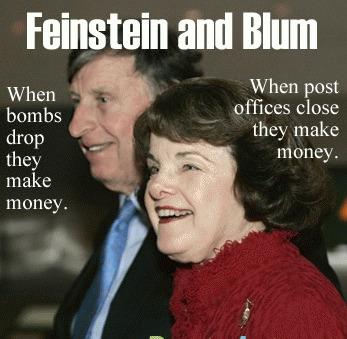 And yet after years of CIA criminality, including torture of terror suspects, even those against whom there was no evidence, lying to Congress, and manufacturing of evidence that led to the disastrous and criminal invasion of Iraq -- for all which there were no consequences in the Congress or in her Senate committee -- it was Sen. Feinstein who finally called out the CIA for spying and lying. We'd be excused, I presume, for pointing out that there is an element of self-interest here, or at least of wounded ego. While her surprise address in the well of the Senate earlier this week denouncing the Agency did refer in high-minded terms to the CIA's having "possibly" violated the Fourth Amendment with its proscription against warrantless searches and seizures, and of its having trashed the concept of Congressional oversight and the sacred concept of tripartite government, it is really a matter of her own ego that was stepped on that set her off. ..